Travel with Kevin and Ruth! 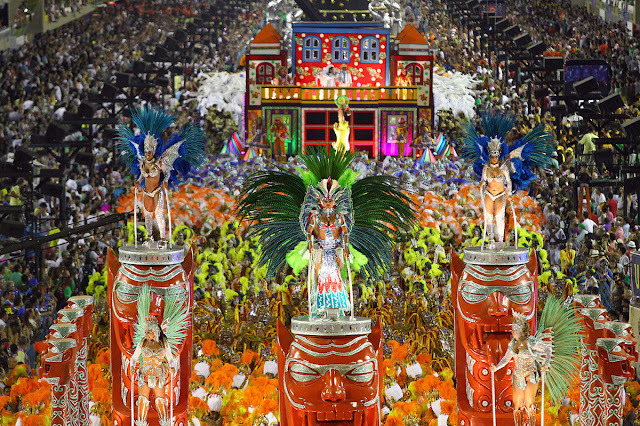 : Carnival in Rio de Janeiro...? It's one of those bucket list type of things. Not that we have an official bucket list, but if we did I'm pretty sure that going to what could arguably be called one of the biggest parties on the planet would be on the list! So we tossed around the idea very quickly, but it just wasn't a good enough price. Something better will come along. Our winter plans have us driving down to Mexico City area in October, then flying to Colombia for six weeks, then back to Mexico City in mid December. We'll then spend some time touring in the motorhome. We want to go back to Puebla, and possibly Veracruz. But that depends. We're hoping to have Ruth's cousin and her husband join us in Mexico sometime in January and so our touring around will depend on where they want to visit. But when they leave, we'd still like to do one more flight somewhere from either Mexico City or Dallas. Just to go on holiday somewhere for a month or so! It's almost as much fun planning this stuff as it is taking the actual trip! Oh...we've got a contest winner for you! Our giveaway from last week was a free copy of one of the Frugal Shunpiker Boondocking Guides and when we pulled a name out of the hat (electronically speaking!) we were very pleased to see that our friend and long time reader Doug Maus was the winner! Doug is a boondocker extraordinaire who spends the better part of his current life boondocking in his fifth wheel. So we're very happy to see that the prize will go to someone who will actually get some use out if it! They're actually calling for a solid 24 hours or so of rain. That's something we haven't seen yet this year, so we don't mind. It's supposed to start around noon and we're supposed to get around two inches of water. Check out the deal of the day at Amazon.com! Thanks again for doing any of your Amazon shopping through any of our links. Simply click the link and shop as you normally would. You pay the same price that you would anyhow, but we get a small commission. Amazon takes care of the rest! We both win! Canadians can shop here...on Amazon.ca! I thought that prices was pretty dang good. Looks like you two will be having another winter making memories. For people living in the States it is but once you add on the difference of the Canadian exchange rate it isn't as great a deal as what we would like. Loots of opportunities for you thats for sure, we be watching you. Yes,there are always lots of choices out there! I've never been to Carnival en Rio, but from what I've seen, read and heard, complete madness.